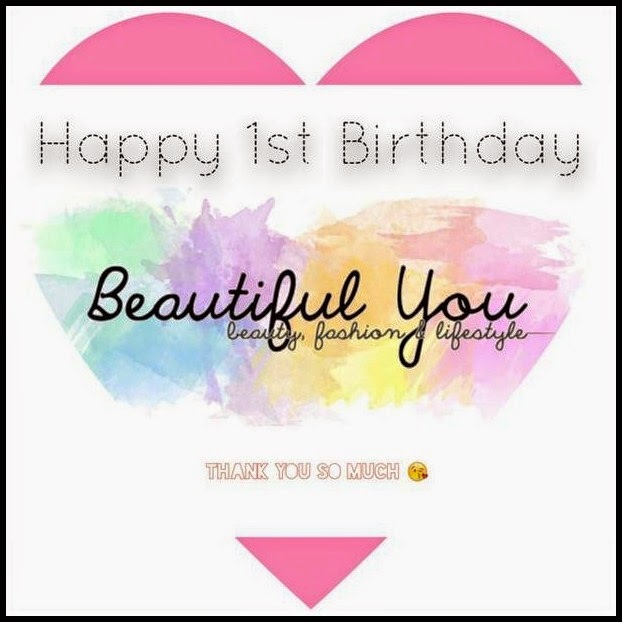 Beautiful You: HAPPY FIRST BIRTHDAY BEAUTIFUL YOU! HAPPY FIRST BIRTHDAY BEAUTIFUL YOU! I cannot believe that I am writing this post, this has come around way to quickly for my liking but that's life I suppose. This time last year I was an extremely nervous 18 year old, with only a few weeks left before I moved away to uni, who had a brilliant idea to blog about my journey! Now I am sat at home at half past eleven at night almost a year later thinking 'where on earth as all that time gone'! When I started this blog it was meant to be a place for me to express my opinions on products, share outfit of the days or share my experiences at uni with similar minded people. I used to be quite quiet and reserved and not really sure of myself but now a year later I have more confidence, I am happier and I am more independent which all stems from my blog and moving away for university! I never in a million years thought that I would have anywhere near the followers that I have and although it may not seem a lot to some people, I never really stick at one thing for too long so this is an achievement for me! I cannot thank every one of my followers enough, whether you have been here from the start of whether to came across my blog last week, I love you all loads and I am really glad that you can share this with me! As a little thank you some of you may know that I have been running a giveaway for the last month to win the Urban Decay Naked Basic's Palette and a MAC lipstick of your choice. It was supposed to be ending tonight a midnight but I have decided to keep it running for a extra week because I am going to be blogging every day next week, SURPRISE! It is going to be a crazy week next week as I a packing up to move back to Bournemouth, I am having my hair dyed again and now I am blogging every single day! I am going to try and blog about a variety of subjects, they say variety is the spice of life so I hope you guys enjoy it! It will be starting from Monday as usual and then finishing on Sunday the 14th! I also just have to give a specific mention to my sister Bryony for encouraging me to start 'Beautiful You' in the first place and for just generally being there for me. This blog post also cannot be written without me giving a big thank you to Becky from Angels Secrets as my blog would not be where it is today if I didn't have the support from this one, she is my blogging rock sometimes and I cannot thank her enough. I love both these girls loads! Again, I just want to say a massive thank you to each and every one of you guys for following my blog and sticking around for the long haul! I promise I will be better at blogging when I get back into my routine of uni again and I have everything organised, I love a bit of organisation me! I think I should round this off before I waffle on for ages, so I will end it with a huge thank you and lots of love to you all!